Japanese thermal minerals. Aluminium and paraben free. Dermatologically tested. Suitable for even the most sensitive skin. This product has been tested to ensure its gentleness. 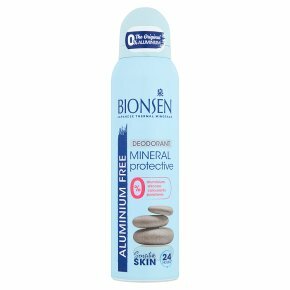 Does not contain propellants harmful to ozone layer.Bionsen Mineral Protective Deodorant with Japanese Spa Minerals gently deodorises even the most sensitive skin without preventing perspiration. Its formulation includes ingredients that help prevent unpleasant odours, providing a natural sensation of freshness that lasts all day. Danger<br>Extremely flammable aerosol. Pressurised container: may burst if heated. Keep away from heat, hot surfaces, sparks, open flames and other ignition sources. No smoking. Do not spray on an open flame or other ignition source. Pressurized container: do not pierce or burn, even after use. Protect from sunlight. Do not expose to temperatures exceeding 50°C/122°F. Keep out of reach of children.